If you’re anything like me, hitting up all the Game of Thrones filming locations in Europe is a personal dream of fandom proportions. Like most, the Game of Thrones hiatus probably has you climbing the walls, you’re in for some good news. The season premiere is finally about to debut on April 14, 2019. But you already knew that. It has been marked on your calendar for over a year now. And now you’re in full prep mode, consuming all the Game of Thrones episodes, theories and fun facts you can before the big day. We’re all in the same boat. But if you want to be a little “extra” about it, you’re going to want to visit these filming locations. And you’ll be in for quite an invigorating trip. We’re going to review all the hotspots you’ll want to visit in a minute, but first, let’s talk logistics. Once you get to Europe, the most efficient way to get around and see all the sights is by car. Consider renting a new sedan, so you won’t have to worry about maintenance or roadside assistance. Your GPS should get you from location to location without too many hiccups. But if you’re really tight on time, you may want to forget the car and take flights or train rides to each of the Game of Thrones filming locations in Europe. This won’t be the cheapest option, and it will require some planning, but it will help you get the most out of a short trip. Trust me, you’ll want to see it all. You’re ready to explore, and we’re ready to reveal your destinations, but we do have one word of caution before we begin. If you’ve waited until now to watch Game of Thrones, you may encounter some spoilers. If that’s the case, simply stop at this list before reading the rest of the post. Okay, now that there are only us diehard GoT fans left, we can proceed. Read on and enjoy the journey. If you thought Winterfell had changed since the first season, you would be right. But Doune Castle was the very first House of Bolton, and it’s a real fortress located in central Scotland near the Sterling District where the original Winterfell scenes were filmed. But that’s not all this castle is famous for. If you’re planning a visit, you should also know that Doune Castle was the primary filming location for Monty Python and the Holy Grail. If you’re up for some fun, you may want to visit on the annual Monty Python Day. While you’re here, nothing is off limits. You can explore every nook and cranny of the House of Bolton. Where Brann fell. This is real life Winterfell. In my opinion, one of the most exciting of all the Game of Thrones filming locations isCastle Ward. (Home to Winterfell and where we are introduced to key characters in S1E1 Winter is Coming). Castle Ward is a 16th-century tower that sits on 820 walled acres of gardens and woodland. It’s also the exterior of where Bran falls from a window, arguably one of the most memorable scenes in the series. Here you’ll get to meet with the great folks at Winterfell Tours who will get you into costume and teach you a thing or two about archery with their official Game of Thrones Experience. In an iconic on-screen moment, Arya Stark, disguised as a boy, flees from King’s Landing along an ominous tree-lined pathway (also known as King’s Road). King’s Road’s real name is Dark Hedges (even more ominous), and you can find it in Northern Ireland. And if you have someone tagging along who isn’t a GoT fan, no worries. They’ll still enjoy this trip. The Dark Hedges were voted one of the top 10 most beautiful places in the world by Architectural Digest Magazine. Fun fact: In 2014 a massive storm destroyed a few of the trees known as the Dark Hedges. HBO commissioned a woodworker to take the wood and craft ten doors depicting scenes from the show. 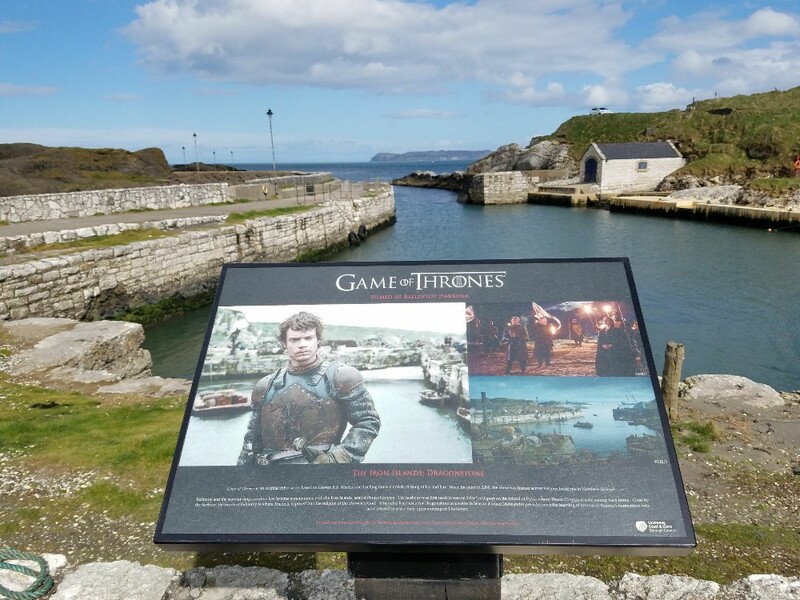 The ten Game of Thrones doors can be found in pubs along the Game of Thrones trail in Northern Ireland where the cast and crew would wind down after a day’s work. Remember when Theon returned to the Iron Islands and was met by his sister Yara? Okay, so this may not look like the most fun place to visit, but it was intentionally portrayed that way for the show. Yes, the Harbour has its dark days, but it can also be sunny and beautiful. The weather can be unpredictable, so try to plan for the weather you want. Some people may want the dark and dreary because it’s almost like Game of Thrones, but others prefer sunshine no matter what. For a more comprehensive list of filming locations in Northern Ireland, check my first tour and second tour of these places. There are so many places to explore in Northern Ireland along the GoT Trail that you really want to go into a rabbit hole in this one. For example, you have the Cushendun Caves where Melisandre had her shadow baby, Antrim Hills at Cairncastle where Ned Stark beheaded the Night’s Watch deserter, Larrybane where Brienne beat Sir Loras in a tourney and is given a place in Renley’s Kingsguard, where Renley swore to Lady Stark he would avenge Ned Stark’s death and where Renley met his fate by Melisandre’s shadow baby, Downhill Beach where the Seven Idols of Westeros were burned, the Canal at Carnlough Harbour is where Arya Stark was repeatedly stabbed by the Waif, Portstewart Strand, Northern is filmed as the Coast of Dorne, Tollymore Forest is where you will recognize just about any forest scene and the scenes with the Dire Wolves and White Walkers in the earlier seasons, Audley’s Castle where the Red Wedding was filmed and one of the “Twins”. If you’re a true fan, you’re going to want to bundle up and head to Vatnajökull. Not only is it the largest ice cap in Iceland, but it’s also the location where they filmed scenes that took place “beyond the wall.” You might be surprised to learn that there are many volcanoes and volcanic lakes that lie beneath the ice cap. There are a few other places in Iceland to explore film locations as well. Arya Stark spent a great deal of time learning the ways of the Many-Faced God in the city of Braavos. But you too can visit the House of Black and White in Girona, Spain. Maybe you won’t learn how to fight like a badass and shapeshift, but this stunning location is still worth the trip. Please note there is also a very recognizable place in Northern Ireland which is considered Braavos as well. See this post for more info on that. This jaw-droppingly beautiful location is home to none other than King’s Landing in Dubrovnik. Visit the city and you’ll feel like you were transported into an episode of Game of Thrones. And then you’ll take a GoT tour (naturally) and get pictures at all the memorable locations. While you’re on this epic vacation, don’t forget to take pics and drop your Instagram handle, so we can be there in spirit! Lately, Malta has become one of the most popular places to explore the GoT filming locations, and understandably so. The walled city of Mdina doubled up as King’s Landing, the island’s forts served as the Red Keep, and the stunning natural arch known as the Azure Window in Gozo was the setting for Khal Drogo and Daenerys Targaryen’s wedding. For more information about the Malta locations, check out my post here. Hitting up all the Game of Thrones filming locations in Europe is probably a pipe dream for most, but it’s still really fun to see the places in their natural form. I hope you have some time to click the links to my other posts where I share first hand my experiences to these locations. If I had to make one trip, I would make it to Northern Ireland. It’s where they film the most and where there is a full-on trail for you to explore. Good luck! And hang tight, winter is coming!